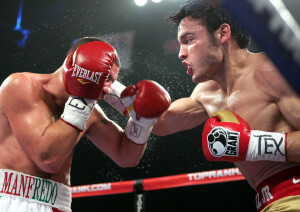 Julio Cesar Chavez Jr. did what he needed to do, and now his promoters may have to do what THEY need to do. In referencing a story I had previously placed on this site, Chavez was in a rather low-risk situation with an opponent named Peter Manfredo Jr. on Saturday. Even Manfredo probably came into the bout with the understanding that unless he brought a baseball bat in there, he wasn’t walking out of that Houston ring with a title belt. I have no idea how many of you looked at that fight, but my impression is that Chavez had better get a big payday soon, and he better make it count. He’s not horrible, but I don’t see that he is going to crack the upper reaches of the middleweight division or any division, despite the HBO crew trying to promote the idea that working with Freddie Roach – who they are running a documentary about – is doing wonders for him. I think everyone knows by now that there aren’t many wonders to be found. So what is the whole purpose of this thing? Well, from where I’m sitting, it’s got to be a fight that will do two things: score huge at the gate, and score huge with a niche audience on pay-per-view. I doubt Chavez Jr. is going to sell in a mainstream way right now. The “recognized” middleweight champion (in the words of HBO) is Sergio Martinez, and he certainly would be a target for Chavez to aim for, but is Martinez the kind of fighter that people will go crazy for in a pay-per-view? It seems if that was the case, the “recognized” middleweight champion would have been in one or two of them by now. Besides, he seems far too advanced for Chavez to be fighting right now, or perhaps at any time. The ticket here, obviously, is Canelo Alvarez, who is defending his WBC light middleweight title this weekend against Kermit Cintron. Alvarez is one of those fighters who may not have headlined a pay-per-view yet, but has probably accounted for pay-per-view buyers on shows where he fought on the undercard, most notably the recent Floyd Mayweather-Victor Ortiz show. He is in the “bullpen,” so to speak, waiting to bust through with a PPV opportunity all his own. Let’s face it, he has a lot of the qualities – he’s young, very slick for his age, has a great story behind him, and is an action fighter as well. He is not going to cheat the viewer. And he can whack. Just like some political candidates have the charisma to get people excited, Alvarez can do that as a headliner. Chavez Jr. probably isn’t quite at his level, but these two guys would most likely make a pretty decent fight. And with the Chavez name working for it, such a promotion would sell out a stadium in Mexico. Since we also know that the Latino audience is probably the most dependable when it comes to pay-per-view, I doubt the numbers from this fight would disappoint anybody. The only stumbling block here would be the fact that there are different promoters involved in the respective careers of Alvarez (Golden Boy Promotions) and Chavez Jr. (Top Rank). News flash – Bob Arum of Top Rank doesn’t much care for Golden Boy and the people involved in it, Oscar De La Hoya and Richard Schaefer. And they don’t really care much for him either; in fact, the very existence of Golden Boy is a by-product of De La Hoya’s acrimonious split with Arum. But here’s another news flash: unlike mixed martial arts, when there’s money on the table, promoters in boxing often do find a way to work together. In this case, I’m not sure they would even hesitate. In fact, they’re already talking about reaching an agreeable catchweight, from what I understand. So if that’s the fight that can get you excited, cross your fingers this weekend; not for the fight to be made, but for Canelo, who better not go to sleep against the hard-hitting Cintron or, well, he’ll go to sleep, if you know what I mean.